What is the difference between the Fifty Two and the standard Hydra? If the standard Hydra has 20 LED diodes and is perfect for an area 2ft x 2ft which covers most standard tanks, then the Hydra Fifty Two with 52 diodes will cover an equivalent area 3ft x 3 ft making it more suitable for wider tanks or deeper tanks if positioned closer to the water. If however you have a standard sized aquarium, the benefits of the Fifty Two are still present in that you have a greater ability to change the colour of the light without reducing the PAR output compared with the standard Hydra. By this I mean that with 20 LED, if you want a particular coloured light output then you might on average turn down the power to up to half of the LED to achieve this colour and so have half of the output. With the Fifty Two you can turn down half of the LED to achieve the same colour and still have a greater output than the standard light. Combining the control of the AI Vega and unmatched power of the AI Sol, the AI Hydra FiftyTwo brings a new level of performance. At a maximum of 135 watts from the wall, it follows in the familys efficient footsteps. The AI Hydra FiftyTwo puts out a Peak PAR of 304 µMol at a depth of 24 making the unit a superb option for deep aquaria. The AI Hydra FiftyTwo utilizes 52 of the latest high output LED's from leading manufacturers, arranged to provide the best performance. The Hydra FiftyTwo fills the visible light spectrum with light to spare. We set the standard in LEDs, and have taken our years of experience and customer feedback to provide an even wider spectral output with the AI Hydra FiftyTwo by adding 415nm Violet and 400nm UV LEDs to the mix. Colour blending optics The Hydra FiftyTwo comes standard with 80 degree lenses giving you the best balance of power and spread. Our lens optics are custom designed, boasting greater than 90% optical efficiency and including a diffuse exit surface to provide improved color blending. Optional 50 degree lenses are available for those needing more penetration. AI Controller The new Hydra FiftyTwo can be controlled wirelessly via the new AI wireless mark II controller or by the AI director Efficiency At just 135W (max settings) from the wall per module, the Hydra FiftyTwo is one of the most efficient Pro level lighting solutions available. With low energy consumption and minimal heat output, you can watch your coral grow and your energy bill shrink. Wireless With built-in wireless control capabilties you can connect wirelessly to any of our Wireless controllers without being tethered to the light. Compatible with the AI family of wireless controllers, the New Controller is an easy-to-use set it and forget it solution. If you need more advanced control, our web-based Director solution can be used anywhere on the web or mobile devices. 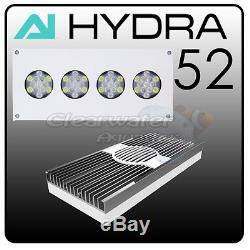 The item "AI HYDRA 52 LED LIGHTING MARINE CORAL REEF FRAG CREE WHITE ORIGINAL MODEL" is in sale since Tuesday, May 23, 2017.